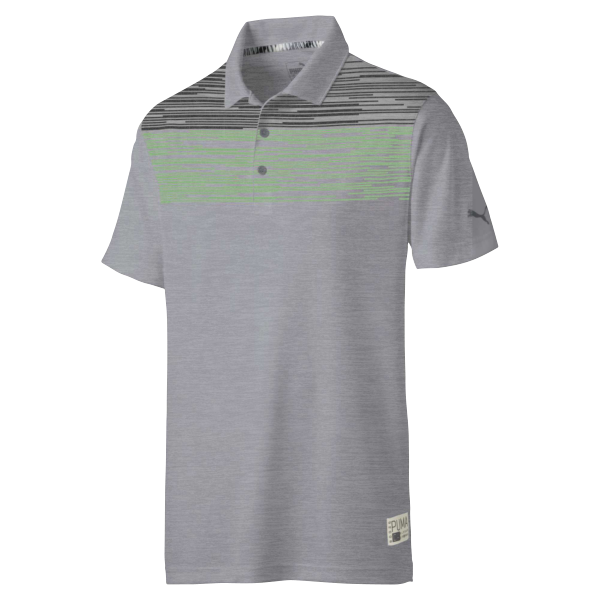 Puma Golf's 2019 collection introduces stylish Spring & Summer style with new technical fabrications for the perfect blend of on / off-course wear. Puma Golf has introduced its Spring Summer 2019 apparel and accessories collection for men, women and junior golfers, featuring streetwear inspired designs blended with the company's heritage performance gear for the ultimate in comfort and style both on and off the course. SS’19 introduces fresh styles, graphics and spring colour stories, combined with cutting-edge technical elements including ALTERKNIT, 3D knit textured fabrics and FUSIONYARN Flex, a crafted blend of performance and natural fibers for the perfect fusion of everyday comfort, distinct style and on-course performance. This season’s new take on the popular FUSIONYARN fabric, adds elastane fibers for greater range of motion, an update first requested by Rickie Fowler during a photo shoot last winter. The new FUSIONYARN Flex fabric, with four-way stretch, blends the softness and breathability of cotton with the moisture-wicking properties and durability of polyester, delivering a high-performance fusion of synthetic and natural fibers that dries fast, looks stylish and adds comfort in any setting. FUSIONYARN Flex is utilised in three polos in the men’s collection, the Verdant Polo, The Faraday Polo and on the women’s side, in the Burst Into Bloom Polo and the Race Day Polo. In its SS’19 collection PUMA is unveiling ALTERKNIT, a technique that delivers pattern through 3D knit jacquard versus a more traditional graphic print. The knit structure in the ALTERKNIT pieces provides added breathability for all-day comfort. ALTERKNIT is utilised in three key pieces in the men’s collection, the Prismatic Polo, the Radius Polo and the Palms Polo; and on the women’s side, in the Burst into Bloom Polo. In addition to elevated polos & layering pieces, SS’19 delivers first-in-class bottoms, introducing the aptly named Jackpot pant & short, focusing on the elements needed to hit the pant jackpot – fabric, fit and function. These modern pants, feature a moisture-wicking polyester fabric, stretch-mesh waistband and are designed to fit and drape perfectly. The Jackpot 5 Pocket Pant will be available in nine colours, including a new pale pink, peacoat, white, black, orange, chocolate brown, quiet shade, surf the web, and Ashley blue; the Jackpot Shorts will come in 14 different colours, including pale pink, fuchsia purple, blue azur and many more. PUMA’s new line will continue the brand’s focus on ladies, taking inspiration from athleisure, infusing performance fabrics and silhouettes that work well both on and off the course. The collection will see new colours and styles added to the brand’s popular women’s bottoms that incorporate PWRSHAPETM Technology, engineered to provide a smooth, slimming effect and deliver the ultimate in support and comfort from a bonded waistband and flatlock seam construction. A key addition to the women’s line up for 2019 is the tennis-inspired PWRSHAPE On Repleat Skirt which will come in four fresh colourways, including Black, Pale Pink, Peacoat and Bright White. The above-mentioned styles, along with the rest of the SS’19 collection, are designed to seamlessly transition from the office, to the golf course and everywhere in between, while providing premium comfort and feel every step of the way. The SS’19 Collection, available now online and at retail, will be worn on Tour by the likes of style icons such as Rickie Fowler, Bryson DeChambeau and Lexi Thompson throughout the 2019 golf season. For more information on the entire collection visit pumagolf.co.UK.